If you have just installed Windows 8 and are getting used to how it works, you’ll soon realize that it works better on mobile or touch devices than it does on a traditional desktop. Windows 8 is programmed to open many programs using its default apps such as PDFs in Windows 8 Reader, and photos in the Windows Photo app. Unfortunately, Windows 8 apps are distinct from the desktop programs and don’t offer a smooth switch over from app to desktop program. Furthermore, many of the apps are pretty basic and don’t offer the wide set of options we are used to in desktop programs. 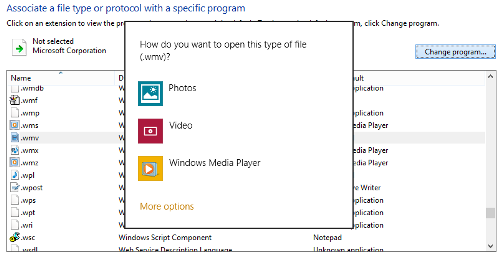 Luckily, Windows 8 is all about user preferences, so you have the option to open documents in a program of your choice. 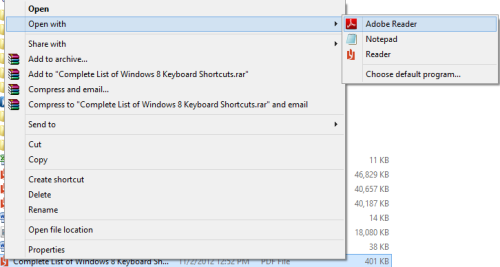 In this tutorial, I’ll show you how to open PDFs in Adobe Reader, rather than the default Windows 8 Reader. You can open PDFs in Adobe Reader in one of two ways. 1. Right-click the PDF and choose Open with. 2. From the Open with drop down list, select Adobe Reader. You’ll only have to do this procedure once. 1. Right-click the PDF and choose Open with. Alternately, in File Explorer, on the Home tab, in the Open group, click Open. 2. From the Open with drop down list, select Choose default program. 3. In the pop up window, select Adobe Reader. that’s all. You can choose to open PDFs in Windows 8 in Adobe Reader rather than the default Windows Reader app. All this is pretty simple, if you need to change only the settings for a single program, but what if you had a whole set of programs that you want to modify? Clicking each and every program file is going to be a waste of time. There’s a quicker way to go about it. 1. Right-click the right corner of the Start screen and select Control Panel. 2. Click Default Programs. If you don’t find the option right away, in the View by drop down list, select Large icons. 3. Click Associate a File Type or Protocol with a Program. 4. Find and select programs on the list you want to change, click Change Program and choose the program you want it to default it to. 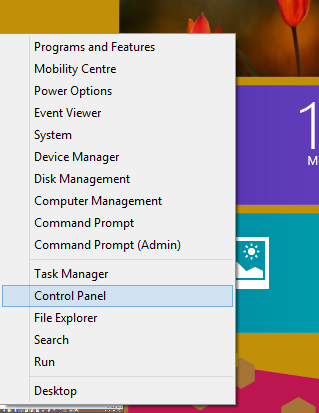 Now you have control over how you want your favorite programs to open in Windows 8. If you have other programs you want to change the settings to, this tutorial should be of help.